Swardeston is situated in the South Norfolk Local Government District and has an area of almost 400 hectares. The parish is situated some 5.5km southwest of Norwich, and only 1.5km west of the Roman town of Venta Icenorum. In 2001 it had a population of 540 people. The earliest recorded objects are a number of prehistoric worked flints (NHER 17834, NHER 40407) and pot boilers (NHER 28719). Two Mesolithic flint cores (NHER 50099, NHER 50103) have also been recovered, as well as a Neolithic polished stone implement (NHER 9715) and a number of Neolithic tools (NHER 39785, NHER 40408). The earliest recorded monument is a possible Bronze Age ring ditch (NHER 17735), the cropmark of which was visible in 1980. An Early Bronze Age flat axehead (NHER 28718), a Middle Bronze Age palstave fragment (NHER 11691) and two scatters of Late Bronze Age flint (NHER 37650, NHER 37651) have been recovered, as well as a flint working site which may date to the Late Bronze Age or Early Iron Age (NHER 40406). Also dating to the Late Bronze Age are three core fragments and a number of tools (NHER 37649) recovered during fieldwalking in Mangreen Hall Farm. No monuments from the Iron Age or Roman period have been recorded, though a number of Roman objects have been found. These include pottery sherds from three sites (NHER 11691, NHER 28718, NHER 39785), as well as coins from eight sites (NHER 17648, NHER 35022, NHER 50103). Of particular interest is a clay mould of a 4th century Roman coin (NHER 35022), used to produce copies of an official coin. Other objects of interest include a finger ring (NHER 11691), weights (NHER 37649, NHER 40407), a copper alloy bowl found upside down over a backfilled trench (NHER 39785) and an enamelled headstud brooch dating to around AD 100 to 200 (NHER 17648). Although there are no recorded monuments dating to the Saxon period, a number of objects have been discovered. These comprise pottery sherds (NHER 39785), an Early Saxon brooch (NHER 40407), a Middle Saxon coin (NHER 28718), a Late Saxon copper belt fitting decorated with ring and dots (NHER 17648), a Late Saxon brooch fragment (NHER 11691) and a 10th century Winchester style strap end (NHER 29293). Swardeston is listed in the Domesday Book of 1086, and although the listing does not indicate that the settlement is notably populous or valuable, a church is mentioned. There are two church or chapel sites listed in the parish, but the site of St James’ Chapel, Gowthorpe (NHER 9717) was endowed in 1286 so the church mentioned in the Domesday Book is most likely the present day church of St Mary (NHER 9474). Today the earliest visible part of St Mary’s Church (NHER 9474) is the north and south windows which are thought to date to the early medieval period. However the building is largely 14th century, with a 15th century porch, south door and dado. Some stained glass of the 14th century survives, and it is interesting to note that this would have been the parish church of Edith Cavel, who grew up in Swardeston and whose father was vicar of the church for forty-six years. The only other medieval site is the moated site around Mangreen Hall (NHER 9767). However, a number of buildings of architectural interest built during the late medieval period do survive, and these include Wattle Cottage (NHER 17662), which began in the early 16th century as a timber-framed open hall with a smoke bay at the east end. The Croft (NHER 34072) also began life as a 16th century timber-framed hall, as did the Garden House (NHER 34073), which had a lobby entrance plan. 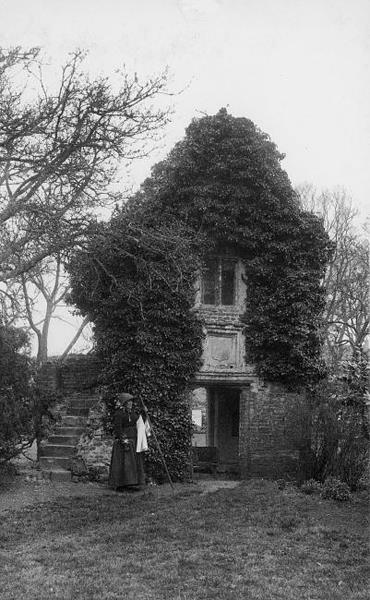 One of the most important buildings during the late medieval and early post medieval period, barring the church, was Gowthorpe Manor (NHER 9716). It is known that the Styward family held the manor here and constructed a timber-framed house around 1520. The current building is a product of numerous 16th, 17th and 18th century alterations and additions to this original medieval building, and there is a 17th century gazebo and barn nearby. Also of importance during the post medieval period was Mangreen Hall (NHER 9767), which was built around 1700 and has elaborate interiors and a fireplace with Dutch tiles. Other post medieval buildings of interest include the red brick Dog Inn (NHER 14665) which was built around 1690, as well as the Old Rectory (NHER 34071), which has a 16th century range and a staircase fitted with 16th century stained glass from the Norwich School. A small number of objects from the medieval and post medieval periods have also been recovered, including pottery sherds from six sites (NHER 11691, NHER 37650, NHER 37651) and coins from ten sites (NHER 17648, NHER 28719, NHER 50098). Other objects of interest include a medieval seal matrix and a 17th century bandolier hook (NHER 17648), an 15th century silver oval seal matrix (NHER 28718) and a finger ring (NHER 28719). From more recent history the Old Cavell Vicarage (NHER 45726) is also of note. It was built in 1865 for the Revd. Frederick Cavell, the father of Edith Cavell. Not only is it interesting for its links to Edith, the nurse and humanitarian who was executed by the Germans in World War One and is known to have stayed here whilst tending her father, but also for the fact that it represents an important example of a largely unaltered 19th century parsonage. http://en.wikipedia.org/wiki/Edith_Cavell. Accessed: 18 July 2007.